The Planning Notepad by John Krissilas: Put on the what?? I don't usually spend much time looking through those "Smart Source" coupon booklets, but this week's version had an eyebrow-raising example of brand extension that's worth writing about. Two examples, actually. Although I'm not a big fan of the idea of extending brands beyond their core competency, when (1) a brand is elastic enough that it isn't strongly associated with a specific product/category, (2) it possesses strong brand equity, and (3) that equity would provide a competitive advantage in a related category, it can work. When this isn't the case, it usually doesn't. Enter Polysporin. Since I was a kid, a cut on the knee always resulted in three things: wash, Polysporin, and a Band-Aid. 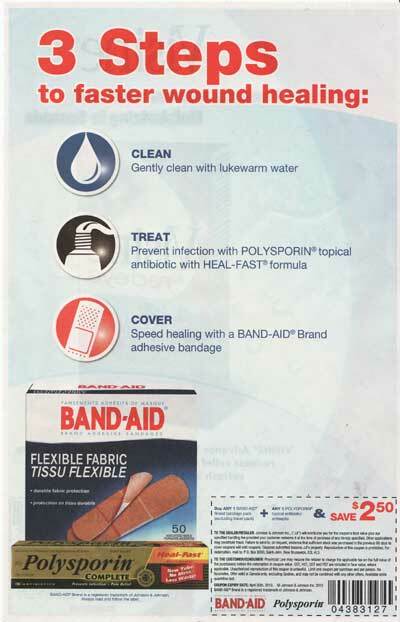 Polysporin found the need (or as some might see it, created a new need) to medicate cuts before covering them, positioning the product as one that can not only prevent infections but help wounds heal faster. Whether or not it actually did this is besides the point, consumers (including myself) are convinced that it works. Over time, additional line-extensions were introduced, as well as claims (like the "Heal-Fast" formula, see below) that strengthened the brand's core competency. Polysporin is a medicated cream that helps wounds heal faster... end of story. Not quite. Just a few pages later I noticed two Smart Source ads for new, non-wound-related Polysporin brand extensions. 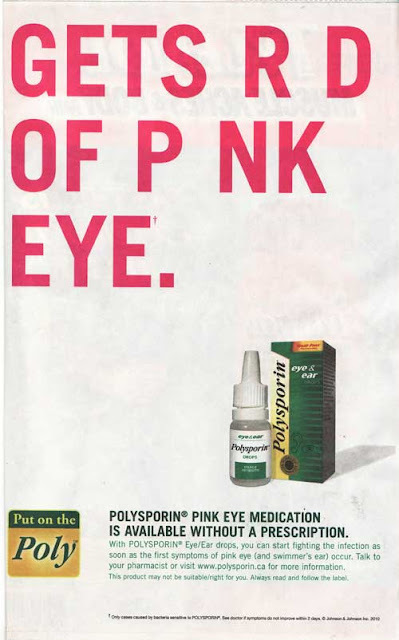 The first is a medicated eye drop product that claims to help get rid of the eye condition pink-eye, also called Polysporin (though the box indicates that the drops are also meant to be used in your ears...). The Polysporin eye/ear drops also feature the "Heal-Fast" claim found on the base product. Interesting. It's clear what they were thinking. 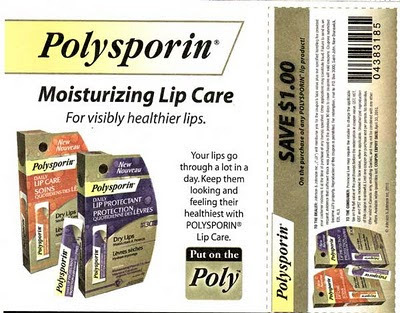 "Polysporin is great at healing wounds and preventing infections, why can't it do the same for lips, eyes, and ears??" Well, I'm sure it can, but that doesn't necessarily mean that you should do it. First off, the Polysporin brand is strongly associated with being a medication for cuts and wounds, a category that it pretty much dominates. It's also strongly tied to Band-Aids. How open would consumers be to thinking about the brand any other way? Secondly, I'm not convinced that the Polysporin brand is providing much of an advantage to these new products - it might even be detrimental to them. When it comes to your eyes, you want a brand that specializes in eye-care. We have doctors that train and specialize in eyes, you'd expect the same amount of competency from an eye-care brand. When it comes to my eyes, there's no way I'm using the same brand/formula that I use on a wound. It's gotta be Visine. The same is true for the lips. When it comes to your lips, you either want a lip specialist (ie. Chap Stick) or a beauty specialist (ie. Burt's Bees). Not only that, the brand also seems to be trying to convince consumers to adopt a new catch-phrase, "Put on the Poly". I doubt that "Poly" is the type of affectionate nickname that consumers usually give to brands that they love (think Coca-cola and Coke, Budweiser and Bud). The full-name - "Polysporin" - sounds like a medication that works. "Poly" just sounds funny. The final problem with brand extensions is that they can degrade the meaning and equity of the original brand. The brand can become a jack-of-all-trades and a master of none, losing the equity and associations it had been building up over all these years. The worst thing that could happen for Polysporin would be if someone to asked you to "Put on the Poly", and you responded, "What kind?"